This moist white and yellow layer cake is a hit every time I bring it. Layered angel food and yellow cake that is filled with a scrumptious pineapple filling. PREHEAT oven to 375 degrees and grease/flour two 8" or 9" cake pans. Sift the flour out 4 times THEN measure it. Do the same for the sugar. Beat egg yolks and egg white until thick and creamy. Alternate sugar and water beating thoroughly. Add salt, vanilla and beat. Fold in flour and baking powder. Pour into prepared pans and bake for 25 to 30 minutes. Check with toothpick. Beat egg whites and salt until foamy. Add cream of tartar and beat until it stands in peaks. Fold in sugar, vanilla and flour which has been sifted 4 times before measuring it. Bake in a greased/flour 8 or 9 inch cake pan for 25 to 30 minutes. Beat egg yolks until light and fluffy. 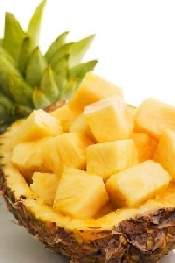 Add crushed pineapple and pineapple juice. Mix the cornstarch in with 1/2 cup water and boil until thickened. Then add to pineapple mixture. Add the butter and stir until melted. Cool. Yellow cake on bottom, then pineapple filling. Followed by the white cake and add pineapple filling. Lastly top with yellow cake. I usually top this cake with Seven Minute Frosting. You may use this recipe or your favorite frosting recipe.